My sister Ellen does not cease to amaze me. She is a semi-professional cyclo-cross rider, meaning that she is combining a top-level sports career with a job. She did not choose the easiest of sporting disciplines. Cyclo-cross is a combination of mountain biking and road racing. It’s quite an easy concept: for one hour – 50 minutes for the ladies – you need to ride around on a closed winding course moving the bike up the hills and through open fields, sandpits and mud. At some points you come across natural or other obstacles like staircases, ditches or wooden barriers forcing you to carry your bike on your back. It requires some riding techniques and bike handling skills. That’s it basically. In reality a cyclo-cross race is brutally intense and spectacular, unfolding fast even though the average speed is low as tarmac sections are limited. As soon as the whistle blows all riders fiercely go in attack mode. It seems fairly chaotic and frantic to be honest. For the whole ride they will be fighting competitors, rain and cold and they hope to avoid mechanicals since their bikes are suffering from all this hardship. But mostly, at least to me, it seems to be a personal motivational battle because you do not have anyone but yourself to rely on. It really is an heroic battle watched by crowds of enthusiastic spectators, screaming and shouting their favorite riders onto the podium. So this is what my sister does, for quite some time now, and she is pretty good at it. In fact she is the second best female rider in Belgium despite her not-so-young age. She is some strong lady, both physically as mentally. She has suffered from cold, pain and exhaustion but hardly ever complains about it. 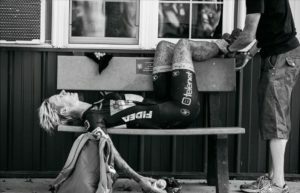 She has travelled several continents to line up for international races, backed by a professional team and a number of dedicated people supporting her in all she needs. The fact that she has a job to do besides racing and training is extraordinary. She claims she needs it to be able to shift her focus regularly. When she is not on her bike, she is taking care of disabled people. It brings her back to reality and helps her to put victories or defeats into perspective. She is greatly admired and respected for this and rightly so. Her dedication and positive attitude also makes her a great promotor for cyclo-cross in Europe and beyond. You can read all about her races through her website or the website of her team. The picture above was taken after an epic race in Iowa last September. Racing conditions were extremely tough pushing the riders really to the limit. It shows the intensity and the physical impact after 50 minutes of racing.I am always glad to see her cross the finish line, ending the physical agony for her, preferably without any injuries. Mostly however, I am amazed how quickly she recovers and moves the focus to the next race which usually is not more than a day or just a few days away.